Everyone knows that Steve Jobs changed the world, but what’s incredible to me is how many different industries he changed it through. The concept and role of the personal computer was changed through Apple and NeXT, the music industry was transformed by iTunes, and the film industry was shaken up by Pixar. I don’t think anyone since Thomas Jefferson has left such a dramatic and lasting impression on the world. What was it that made Steve Jobs different from everyone else? More than anything else, I believe it was his philosophy. 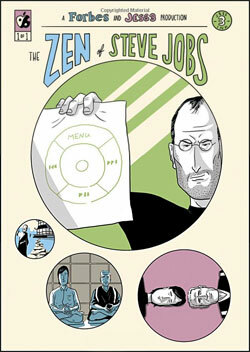 This book, The Zen of Steve Jobs, is a graphic novel published in 2011 which focuses on Steve Jobs and his relationship with philosophy, specifically Zen. It follows the relationship that Steve had with his spiritual mentor, Zen master Kobun Chino Otogawa (shortened to Kobun roshi, Japanese for “master”). By virtue of his rebellious streak, Kobun roshi abruptly left Japan for the Tassajara Zen Mountain Center, where Steve Jobs (and my father, among others) sought wisdom at the first Zen meditation center in the United States. The book is monochrome, uncomplicated, and styled in a way that parallels the concepts within it and within Zen Buddhism: negative space, minimalism, discipline, and focus. I’ve long been fascinated with Zen teachings and the design philosophy of Steve Jobs, both of which are so counter-intuitive on the surface: that less is more. With this thought in mind, I purchased this 80-page graphic novel which I read in a single sitting. Not only did I learn new things about Steve Jobs — surprising, considering I read his 400+ page Walter Isaacson biography — but many of the accounts of his teachings are are as simple and straight forward as they are profound. Like Steve Jobs learning calligraphy from Kundo roshi by repeatedly drawing the character for mistake. Whats also tremendous about this book is the scale and context of it. Despite being very short, it flicks between pivotal moments in Steve Jobs’ life with impressive finesse. From teaching about the circle of all things in the 1980’s to his 2011 meeting with Cupertino City Council about construction of Apple’s proposed “Mothership” building, this book takes a comprehensive look at decades of Steve’s life and connects the dots. This book isn’t perfect, though. Although it’s well drawn and well written, the price is quite high for an 80 page graphic novel that can be read in about 45 minutes, at $9.99. I’m thinking that a price of about half that is more appropriate, but if this is the type of content that you’re looking for I don’t believe there’s any other book which hones in on this particular part of Steve Jobs’ life (surprising, since it played such an instrumental role). The other criticism is that this book can only be enjoyed on iPads or Android tablets. Although the book is monochrome, it cannot be displayed on my Kindle Paperwhite. For that reason, the paper book version might make more sense, costing a mere $3 more. An interesting side note is that Kobun roshi (pictured, at right) was a disciple of Suzuki roshi, the Zen master who first established the Tassajara Zen Mountain Center (which was not only the first Zen monastery in the United States, but was the first outside of Asia). 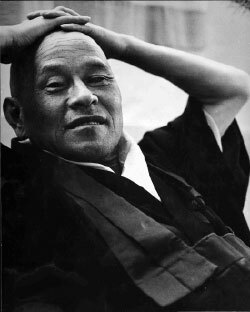 Suzuki roshi is the author of Zen Mind, Beginner’s Mind, my all-time favorite book on the subject of Zen. This book and it’s teachings are referenced several times in The Zen of Steve Jobs. If you have interested in the philosophy of Steve Jobs and you have an iPad, this is an enjoyable book that does justice to its subject matter. There aren’t any passages to include here, so instead I’ll add my favorite sequence: that between Steve’s understanding of breathing and implementation of the circular design in the proposed “mothership” design. Click on the image below to see a larger version.